Integration hub | Is integration stuck? The historian Philip Wood defines a well-integrated society as one in which everyone is a potential friend, regardless of race or religion. However, what data we have on the composition of our friendships (as well as partnering) suggests that on this definition we are falling a long way short. The Government recently released results from the most recent wave of its Community Life Survey (CLS). 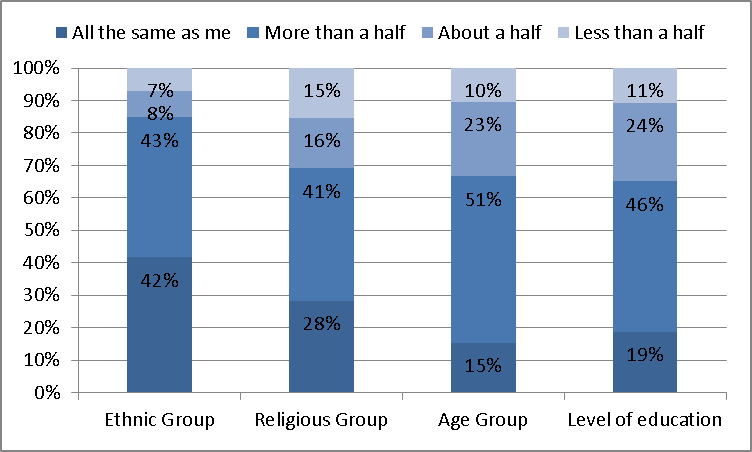 It shows that friendship groups are far more structured by ethnicity and religion than age and education. It found that 42 per cent of British adults had friendship groups that were entirely of the same ethnic group whereas 28 per cent drew their friends entirely from the same religious background. Contrast this with 15 per cent of people having friends entirely of the same age group and 19 per cent of the same level of education. The vast majority had friendship circles that were at least more than half drawn from the same ethnic group – 85 per cent. The Understanding Society social research database presents a picture of even greater ethnic homogeneity in our friendship circles. According to this data source, 53 per cent of adults have friendship groups that are ethnically the same. Moreover, between 2011 and 2015 there has been no change in this figure. Both the CLS and Understanding Society data show that the ethnic majority are much less likely to have ethnically-mixed friendships. Nearly 90 per cent have circles that are more than half white. Ethnic minorities (including white minorities) have more diverse friendship circles although the preference for similarity is strongly present. 62 per cent have more than half or all of their friends who are like them. This is not a surprise as white people are much less exposed to non-whites than vice-versa. But even in more mixed parts of the country there is still a strong tendency to cluster. One study found that social occasions in London were much more ethnically segregated than the rest of England. London is of course the most ethnically heterogeneous part of the country. Research by Raya Muttarak has shown that minority cross-ethnic friendships with white British people are the most likely with those who are white and black Caribbean; those in other combinations of mixed ethnicity are less likely to have white British friends. Religion also seems to have an effect: Indians with no religious belonging are much more likely to have white British friends than observant Indian Muslims and Sikhs as well as Hindus (although the difference is not so strong in the latter case). Generally, predominantly Muslim ethnic groups have the lowest probability of having white British friends with Muslim Bangladeshis having the lowest. Younger generations are more likely to have inter-ethnic friendships. The probability increases with education but declines with neighbourhood deprivation. What about romantic relationships? 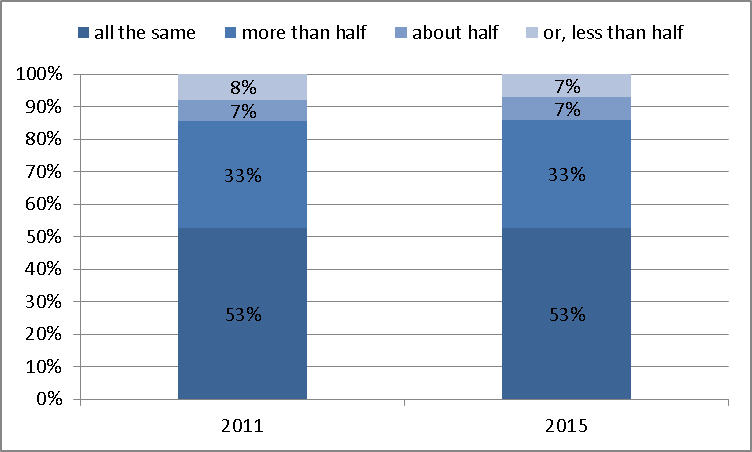 In 2014, the ONS published an analysis of couples and the extent to which people were partnering out. The analysis showed that in 2011, 9 per cent of those living as part of a couple were in an inter-ethnic relationship. This was up from 7 per cent in 2001. The analysis further showed that the white British were least likely to partner out with 4 per cent of couples being mixed. Of the major non-white ethnic minority groups, the most likely to be in mixed-ethnic relationships were black Caribbean (43 per cent), Arab (35 per cent), and Chinese (31 per cent). More moderate levels were evidenced among the South Asians – Indians 12 per cent, Pakistanis 9 per cent, and Bangladeshis 7 per cent. We will have to wait until the next census in order to find out the full extent of any changes there might have been. In the interim, however, we can make use of survey data from Understanding Society. Data from 2015 show that 8.3 per cent of couples were inter-ethnic, so no substantive change there. Table 1 below shows the findings for specific groups. While there are some differences between 2011 and the 2015 estimates, the former all fall within the confidence interval constructed for the latter, meaning no statistically significant changes. So the provisional estimates reveal a picture of no change. Some of this lack of mixing will be down to restricted opportunities – if you live in a segregated neighbourhood or go to a segregated school, then the chances for you to form a friendship with someone different is limited. However, much of this will be down to personal choice. Friendship and relationships are key to integration and yet there is only so much that can be done by Government to foster them. Who you spend your time with is none of its business. However, one thing that can be done is to promote the kind of exchanges that encourage contact. For instance school exchanges across segregated communities. Another thing is to continue to support the National Citizen Service which aims to bring together people from different backgrounds. Another site with potential for mixing is work. People of different ethnicities have been working together now for decades. All major companies now have diversity and inclusion schemes. Many have so-called affinity groups whereby women, or ethnic minorities, or homosexuals, form exclusive networks in order to provide mutual support. The trouble with these is that they encourage inward looking – bonding rather than bridging. One encouraging development comes from Deloitte which recently announced it was doing away with these, preferring instead to create ‘inclusion councils’ where all can take part. Whether this will solve glass ceilings issues or not, we will see. It is also fairly obvious that affinity groups have failed in the past to do so. What companies need to do is to foster ties across our differences in order to better complete the tasks that make up their business. Surely the best way to bring people together is not to dwell on our differences but to focus on the completion of a common task. This would result in better trust and the aggregate outcome would be a better integrated society.